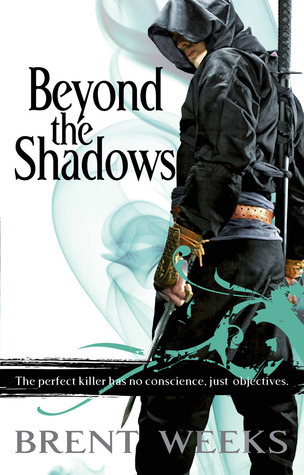 At the end of last year, I read the first in this trilogy, The Way of Shadows, and reviewed it here. Since I read the second at the end of February and the third earlier this month, I figured that my gushing about how much I loved this series was better consolidated into one homage than prolonging the embarrassment! And in case you wondering, yes, this post will have spoilers. If you want to start at the beginning (and you should! ), feel free to check out my review and then head out to the shops or download yourself an eBook! If you want a summary, head over to GoodReads here. I wouldn’t have thought that it were possible but this instalment takes the darkness of the first and makes it seem like a picnic in the sun. Picking up not long after The Way of Shadows left off, Kylar is looking for a way to avoid the sinister persona of the Night Angel or, unless you’re Elene and too stupid to see it, avoid who he is. The plot focuses on Kylar as he establishes himself an identity and tries to save the world. Weeks’ characters are incredible. Harsh pictures of everything that is brilliant and terrible about people, with blends of everything in between. In the first book, some of the characters weren’t that well-balanced: Logan and Elene were innocent, naive and sanctimonious; Durzo was the ultimate assassin, detached and cold. It made them hard to completely relate to. That small shortcoming is more than addressed (for the most part) in Shadow’s Edge. Logan’s trials in the Hole are barbaric and, at times, hard to read without feeling a little queasy. His experiences are worse than most of us can imagine but it takes away the condescending edge to his character and makes him my favourite of this particular book. He’s brave and noble. Some might say too noble but the glimpses of his darker side were enough to temper that for me. The exception to all of this is, as always, Elene. I totally appreciate that she’s a symbol of everything that is ‘good’ and pure but I just wish that she could be good and pure without also being horrendously judgemental. Kylar does inner turmoil quite well enough without Elene adding her holier-than-thou attitude to the mix. Her professions of love got on my nerves in light of how much Kylar puts himself through to prove how much he deserves it. Garoth Ursuul is one of THE most disturbing villains of a trilogy I have ever read. Evil doesn’t come close. Brave it out though because his sheer despicability (I know that probably isn’t a word but I like it…) is shocking but unique. I couldn’t help but keep reading as he became progressively more terrifying and powerful and the characters have to fight growing monsters and magic. The last couple of hundred pages are really hard to put down and the ending is perfect. At the end of the Shadow’s Edge, I got that feeling that is both brilliant and terrible feeling when you finish a book in a series desperate to know what is going to happen next but don’t have the next one with you. Always a brilliant sign. So, what about Beyond the Shadows? The tone to the third book is completely different to Shadow’s Edge. It has a wry humorous edge to it that almost seems frivolous by comparison. It isn’t, obviously, but the darkness is lifted a touch. Don’t get me wrong, I loved it because it was the end to the series but it took me longer to settle into than the rest because it was split between so many different perspectives. The chapters are really short, which sometimes makes the story feel as though it’s skittering around all over. Because so much is going on, there are some gaps. Take Uly for instance. Hailed in the second book as a girl with amazing potential and parcelled off with Vi, I was waiting for her to spring something amazing in the third. And yet she’s barely mentioned; once or twice in passing but that’s it. Which is strange when you consider how much Kylar and Elene are supposed to love and adore her and want to be her parents. I guess that would be awkward with her actual parents back in the picture but still! Phewf, nearly there. Still with me? I couldn’t review the series without mentioning VI! That girl is just plain awesome. Once her façade drops, she’s just fantastic. Her finding her place in the whole battle-for-the-world thing is almost the best bit about the book. The actual best bit about this book? The re-appearance of the inestimable Durzo. As enigmatic as ever but humbled by his new-found mortality, it’s Durzo that lends the light relief from impending apocalypse. Honestly, could he be any more effortlessly charismatic? No, no he could not. Against such a brilliant backdrop, the ending is…a bit anti-climactic. Shadow’s Edge finishes with epic battles and massive drama. Beyond the Shadows has some of that but not all. There’s something a little too tidy about it. If it had finished a little while earlier, I would have been happier, I think. There’s a slightly twee Epilogue too. Sometimes, I love a good epilogue. Other times, it’s better just to leave it and let your readers imagine the future for themselves. OVERALL: Perhaps I haven’t done the best job of telling you how great this series is but trust me, it is. That isn’t to say it’s for everyone, however. I’ll say it again: there are moments when you’ll flinch at the barbarism, moments when you’ll cry at Weeks’ complete disregard for keeping characters you love safe and moments when you’ll smile at the admittedly rather black humour. Read it and love it, just don’t say I didn’t warn you!